Ridley Scott reportedly replaced Kevin Spacey in "All the Money in the World" after more allegations of sexual misconduct against Spacey surfaced. For director Ridley Scott, Kevin Spacey is out. And Christopher Plummer is in. Deadline reported Scott decided to replace Spacey in the upcoming movie "All the Money in the World" and that Plummer will now take on the role. The catch? The report came out 44 days before the film is scheduled to hit theaters Dec. 22. That doesn't leave much wiggle room to reshoot all of Spacey's scenes, re-edit the movie with Plummer's footage and release all new marketing materials. "All the Money in the World" is based on the true story of the kidnapping of oil magnate J. Paul Getty's grandson. Spacey was playing the role of Getty — who infamously refused to pay a ransom. News of the reshoots came shortly after a former television journalist accused Spacey of sexually assaulting her 18-year-old son in 2016. 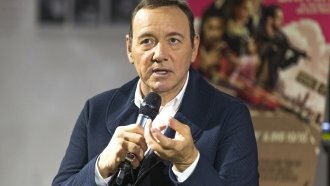 This is just one of multiple allegations of sexual misconduct made against Spacey. It started when "Star Trek: Discovery" actor Anthony Rapp accused Spacey of making a sexual advance toward him when Rapp was 14 years old. The future of Spacey's hit Netflix show "House of Cards" is still up in the air. Production on the show's final season was indefinitely suspended in late October. Shortly after, Netflix announced if the show is to continue airing on its streaming platform, then Spacey cannot be involved. As of Thursday, production had yet to pick back up.